The qibla in Islam is the direction in which prayers should be directed. Technically, this should be towards Mecca, but in the case of the Mezquita built by Abd Al-Rahman I, the qibla (which affected the placement of the first mihrab and the building's alignment) was pointed towards the prince's native Damascus. The Emir was nicknamed "the Immigrant", and perhaps this homesickness for his native land had an influence on the mosque. 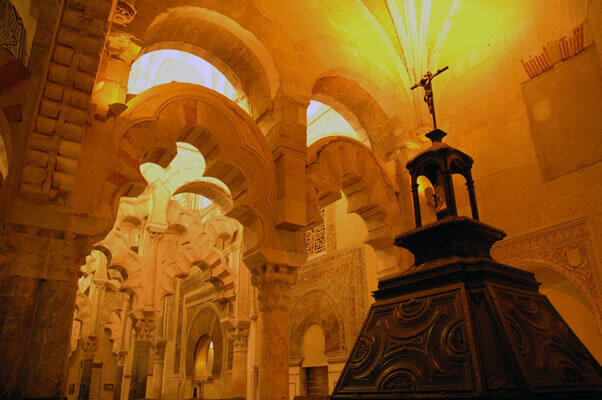 All successive expansions of the mezquita to the south and east respected the original alignment. Some scholars refer to the Mezquita's back wall as the "qibla", which you see here together with the Mihrab, the prayer niche facing Mecca and indicating the qibla to the faithful. It is undoubtedly the most impressive show of Umayyad architectural art surviving to this day. Al-Hakem's maqsura, the area around the mihrab reserved for the sovereign, is surrounded by exquisite columns and interlacing multi-lobed arches.